Nov 7, 2014 Update – I made a public repository in GitHub to hold all of the files for RED. You can find it here: https://github.com/osmaneralp/RED/. RED was designed in SolidWorks. 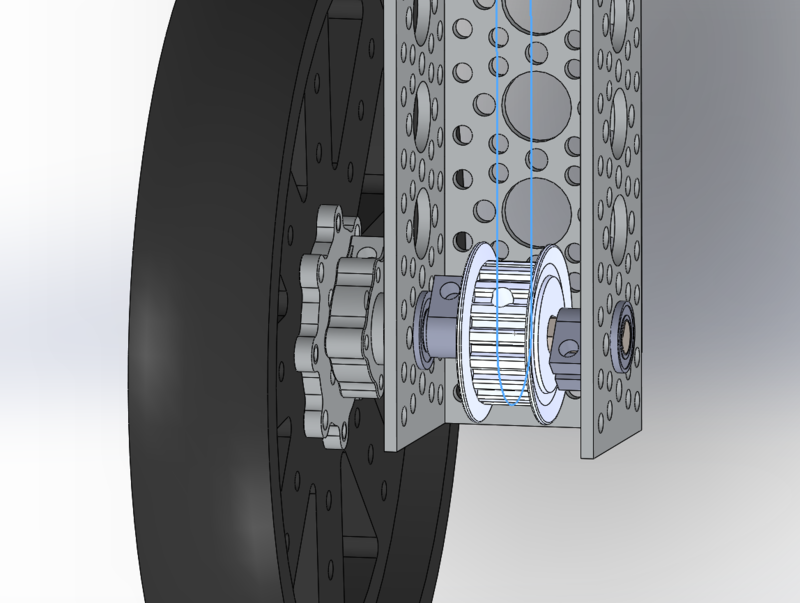 I know a full license of SolidWorks is expensive, but it is the most widely used tool for designing robots. If you are a student, you can get an educational version of SolidWorks for about $200, which is very reasonable. – The belts don’t turn because the pulleys are fully defined. – The design as a whole is under defined. 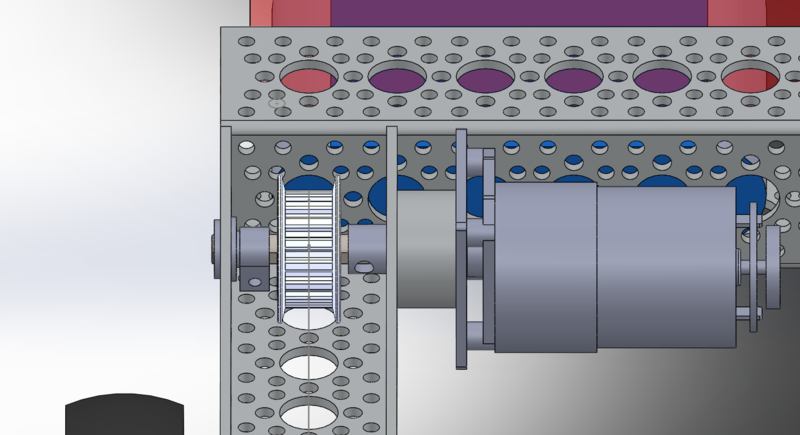 Despite these problems, you can still use the drawing to see what parts are needed and how the parts fit together. I’ll fix the problems when I get time. 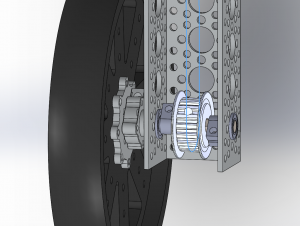 A SolidWorks pack and go file is available in my GitHub repository: https://github.com/osmaneralp/RED. The code for RED is contained in two sketches: robot.ino and motors.ino. Most of robot.ino is related to initializing the MPU-6050. I should really move it to a separate file. 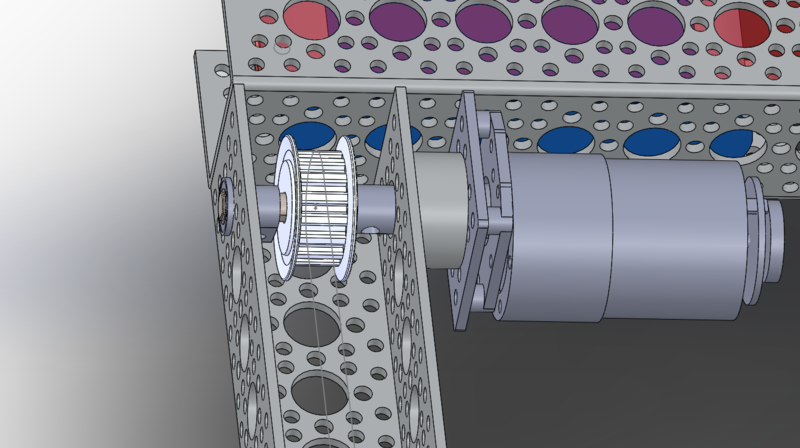 Most of the motors.ino file is for reading the wheel encoders. I am using an interrupt on each edge of both phases of the quadutrature signals for each wheel. That’s a lot of interrupts. The Arduino Due can keep up. I don’t know if a slower Arduino, such as the Uno, can keep up with so many interrupts. This is one reason I chose the Arduino Due. In addition to the two sketches, I used the following libraries: I2Cdev, MPU6050, PID_v1, and PS2X_lib. The PS2X_lib did not work with the Arduino Due, so I made some modifications to make it work. One thing I discovered is that a lot of libraries are not yet ported to the Due. If you choose a Due, be prepared to make changes to code that works for all the AVR based Arduinos. Thus, I would not recommend the Due for a beginner. The Arduino files are available in my GitHub repository: https://github.com/osmaneralp/RED. Balancing robots have been around for many years. The first balancing robot I encountered, nBot, was created by David Anderson. His robot remains one of the best even after many years. He describes his robot on his website: http://www.geology.smu.edu/~dpa-www/robo/nbot/. Back in 2010, Kas started a thread on the Arduino blog called Balancing robot for dummies. This was around the same time as I was building my first balancing robot, Blinky. I didn’t use an Arduino in Blinky, but I learned a lot from that thread. It is still an excellent source of information for building a balancing robot. The only way that I was able to create the code for RED in only a few weeks is because of the work of others, particularly those who created open source Arduino libraries, such as Jeff Rowberg’s I2Cdevlib, Brett Beauregard’s PID library, and Bill Porter’s PlayStation 2 controller library. Many thanks! Red was lookin good on 10-29-2014 and keep up the efforts. Impressive. Did you use the encoder feedback in your PID algorithm? Yes, I used the derivative of the wheel position as a damping term in the PID equation. I’ll get the files posted as soon as I can. Please check back in a couple of days. But I mean did you use the encoder feedback to estimate the angle of the beam or just for motor control? Just for motor control. The tilt angle was measured using the MPU-6050 gyro accelerometer combination. 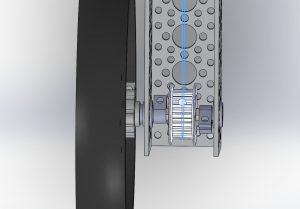 The encoders on the motors I used are incremental encoders. They cannot be used to measure a tilt angle. So then did you use a Kalman filter or a Complementary Filter for your estimator? Sorry to be grilling you for so much information, but we were also in the competition, and we work in a robotics lab and we were having more trouble than expected getting the bot to stabilize. Do you have a video? If so, send me a link and I’ll see if I can make any recommendations to help you stabilize your bot. Sorry, we’ve had a transition of project members who are redoing the code. If I get an update I’ll post it to you. Thanks! Neither! I used the I2Cdevlib. One of the advantages of the MPU-6050 is that it can fuse the sensor reading inside the chip. The I2Cdevlib gives you access to the DMP. In the future, I plan to switch to an ST gyro, so I would need to implement my own sensor fusion. When that happens I will plan to the the FreeIMU library which I am porting to an STM32 microcontroller. Is the arduino code available yet? Red is pretty cool. Can red be cool or should I say Red is red hot? Sorry not yet. I’ll have it up by the end of this weekend. Thanks for posting your files and resource materials! I also made an attempt for this contest, but this was my first balancing robot and I couldn’t get it tuned in time. I am really looking forward to seeing how Red works and hope I can learn enough to get mine working, also. I spent as much time tuning the PID parameters as I did writing the rest of the code. It’s a lot of trial and error. I wish there was an easier way! Thanks for posting your build files. Really cool to see how you did it. I’ve been toying around with making our little furry robot into a two wheel balancer. i download the arduino code from your link and i wonder if you can provide also the wire conection for the Arduino to all other devices. 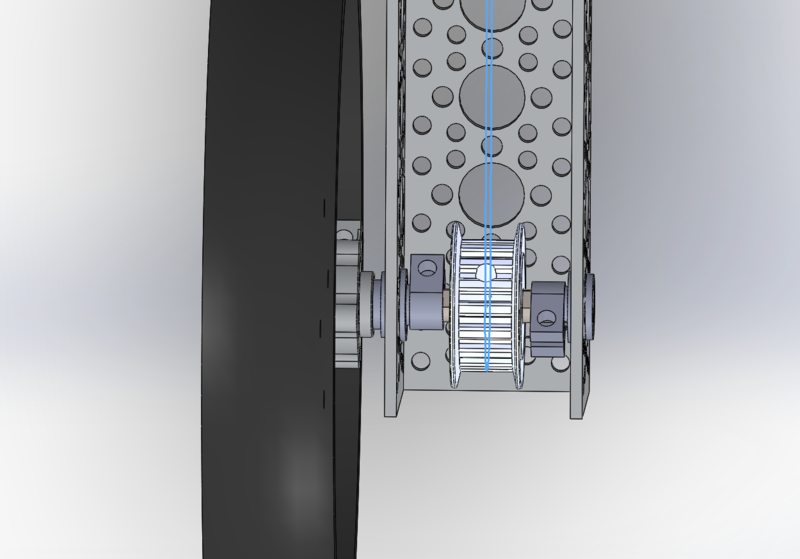 Do you have a wiring diagram for this project? I see on Github you have a robot.ino and motors.ino. Do you have two microcontrollers? I didn’t see where maybe robot.ino called motors.ino, but I only read through the code once. There is only one microcontroller. motors.ino is used by robot.ino. I am trying to do the same thing, but my robot wont stabilize for more than 5 seconds at best. I think it is because the motors only work for larger pwm value, (0-255), it only turns at 80. Do you have any recommendations? I have tried with many different dc motors, but no succes. Ya, turning on at 80 would result in too large of a dead zone. It would be difficult to compensate for that. You are probably alternating your motors between drive and coast. Try alternating between drive and brake.